Best DPS Rifle/Pistol/Bow you have gotten? I hit over 3,000 today. Yeah I use an enchant mod. Once I hit over level 50 or so there was nothing left to do but to keep enchanting so I turned it on. Also I'm collecting Very Deadly Chaos Gems to give me a 100% critical chance when I socket like 20 of them. My current (legit) Rifle does 1200 DPS. It's a normal Blackfist Rifle. Awesome that I can wear it at level 17 with level 10 Bow Mastery. As in "without an enchant mod". The best gun I have ever gotten is The Brittlebone Vampire gun, ultimately awesome. I still use it, I am a Level 14, still in the very long Tu'tara Caverns. <---- She is my Vanquisher, Sara. I love Torchlight, My Main Character is a Vanquisher. Hmm, at around clvl 15 you should start to see cranequin xb occasionally in the blacksmith shop. I highly recommend them, and the Windlass XB that will occasionally show up starting a few turns later. Both drop VERY rarely in the dungeons; buy a normal one from ole' redbeard and begin to enchant it yourself. Crossbows have a little range advantage over all rifles (well, except the Justice rifles), and they remain viable for a long time if you slowly enchant them about 8 times. Also, if you start with a mundane one (no rare enchantment features), if you bust the enchantment one time, you can just start enchanting it again...and generally get slightly better enchantments since your character level has gone up. You won't have lost some impossibly rare feature. My current weapon rifle does around 1000dps. I'm still leveling up to have at least a 20 bow mastery for greater crit and dmg. Police breached the rights of a man arrested with a cross bow near the G20 security fence when they questioned him without a lawyer present, a judge has ruled. What game are you guys playing? There is no ability named "Bow Mastery" in Torchlight. There is a Skill called Ranged Weapon Expertise, but it only goes up to Skill Level 10, like all other Skills in the game. I'm playing a private server of ran online. Have you played one of those games? hi TS. can you put your weapon in the shared stash and send the .bin file to me? 800 dps for a ? R I think it was. Un moded/unenchanted. I'm curious if one day torchlight released with on9 ver. Thought it would be nice to post a legit item in here. Ended up with this after a couple lucky vendor enchants. The current DE chance is 6% so I don't plan on chanting it again until I find a decent alternate. Bought this from the weapon/armor merchant in town, proceeded to enchant with Enchanter in town up to 12% disenchant chance, then further enchanted it using Enchantment shrines. I have an 2030 DPS Epic Arbalest, no mods, no heirlooming, no exploits. 15 layers of enchantment at Shrines, by a near-maxed out character. But I think I may be able to get one up close to 2500 DPS eventually, using a level 100 character enchanting exclusively at Shrines. A lot depends on how much attack speed enchantment you get. this is what im working on while waiting for TL2. it took me 2 weeks to get where its at. i did use copy paste of save games. no mods. no cheats. i must say im crazy about crit and armor pen. do you have any idea how much dps u can get without using copy paste? If you start with a late Unique projectile weapon, in the 700-850 DPS range, and enchant at Shrines for 10-15 rounds (without failing, of course), you should be able to get it up into the 2000-3000 DPS range. However, I don't recommend trying to enchant it more than 10x, unless you have duplicate base weapons and you are enchanting them alternately. Keep the one that fails last. One advantage of only enchanting mundane weapons, or enchanted/rare weapons that only have 'typical' weapon enchants on them, is that if it fails you can just start over. Enchanting Uniques that have affixes that are never seen from the enchantment process, like the 200% Crit bonus on Stark Fist pistols, can be a very painful and prolonged process if you are trying to pump the DPS up to 2000+. I don't understand how you think deeper knowledge of enchanting techniques/success will help you in comparing Alchemist to Vanquisher / Destroyer. Nor are any of the Character Skills dependent on enchanting, or on any particular enchant. Many of the Skills special attacks, though by no means all, ARE dependent on the DPS of the currently equipped weapon, so I guess there is a distant relationship that way. As I said in the my first post, starting with a ~700 point weapon, you should be able to reach about 2000+ DPS with about 12 layers of enchantment. It is somewhat variable however; you could concievably end up with only DPS 1700 plus great Crit Change bonus or great Health Steal. I have had my lvl 100 character enchant a couple of Rare Epic Arbalests up into the 2000-to-2500 DPS range, without copying files, saving files, restarting characters, mods, etc. Pure vanilla. Of course there were several purged crossbows along the way. zekron specified that he was interested in how best to build up enchantments without using copy/paste. Hey, if you don't honor the pain when the game beats you down, you're just playing by yourself...oh...wait...scratch that. sorry didnt see that copy paste, was too drunk. i did my fair share of pain with the game, finished it several times with crappy items, i forgot to mention i just learned that trick last october. 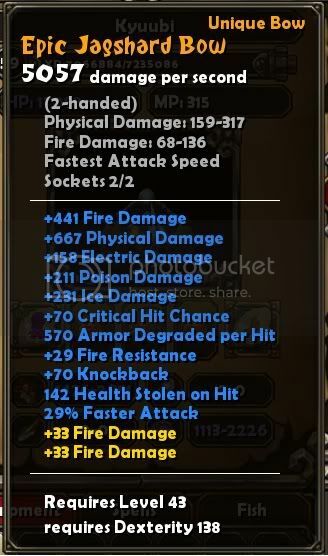 i have a question for you, during my time of enchanting that bow i didnt get other options such as increase crit damage 20%, faster cast rate, or increase missile range.. is there any other rule on getting enchantment options? Sorry to sound noobish, but what do you guys mean by 'copy/paste' for building up enchantments? :? You could put the weapon in the shared chest, back out the game title screen, copy the shared stash file and then go back in. That way if you ever disenchant, you just bring replace the weapon in the stash. It breaks the fun of the game obviously. its quite hard when your choosing enchantment options. took em 2 weeks to make that one. AFAIK (empirically from a LOT of Enchanting), there are certain enchantments that only show up during applied enchanting VERY rarely, and possibly a few that never show up at all. The commonality of enchantments also is modified according to what kind of item it is. IIRC, I have seen Crit Dam increase, rarely, but only by tiny increments. I don't think I have ever seen +range increase. The affix that I am most often looking for, +%XP, increases only very rarely, but apparently never on weapons. I'm not entirely sure, but I think that there is a slightly improved chance to see these very rare bonuses if the item already has some small level of the ability you are hoping to increase.